Greenstone Entertainment Ltd. is pleased to announce its artist line up for the annual Taupo Summer Concert on Saturday 27 January 2018 (Auckland Anniversary Weekend). 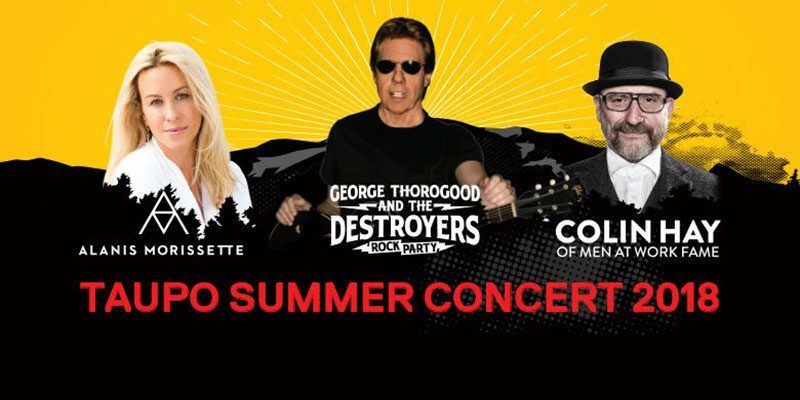 The concert will feature George Thorogood & The Destroyers, Alanis Morissette and Colin Hay of Men At Work fame, who will be bringing to Taupo and New Zealand their unmistakable hits as part of a three date national tour! The tour will also play concerts in Queenstown and Whitianga – hot on the tails of the sell out 2017 Summer Concert Tour which saw audiences of 45,000 across the three shows. Last year’s Taupo Summer Concert featured Icehouse, Alan Parsons Live Project and Bonnie Tyler with previous years artists including Huey Lewis and the News, REO Speedwagon, Melissa Etheridge, Pat Benatar and Neil Giraldo, Foreigner, Heart, Lynyrd Skynyrd, 10cc and The Doobie Brothers. With its unique afternoon atmosphere, a backdrop of the spectacular Waikato River and unchanged ticket pricing, concert goers won’t be disappointed with next year’s 7th annual Taupo Summer Concert line-up featuring the hard driving powerful rock and blues of George Thorogood & The Destroyers, the multi-talented and one of the most influential singer-songwriter-musicians in contemporary music- Alanis Morissette, along with the unmistakable voice and lead singer of one of the most successful Australian Bands – Colin Hay of Men At Work fame.